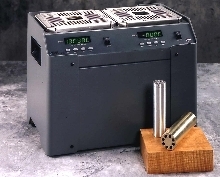 Temperature Calibrator with two calibration wells. Model 9011 temperature block calibrator with 2 independently controlled calibration wells covers -22 deg F to 1238 deg F range. 9011 dry-well offers stability to Â±0.01 deg C and display accuracy to Â±0.1 deg C. Its RS-232 interface with instrument control software allows temperature calibration work to be automated. Users can choose from 4 multi-hole inserts (6-8 holes per insert). Up to eight 1/4 in. probes can be calibrated simultaneously. Hart's new 9011 is two dry-well calibrators in one. With two independently controlled temperature wells, the 9011 covers a range from -30°C to 670°C (-22°F to 1238°F). Now RTDs and thermocouples can be calibrated faster than ever. While readings are being taken at one temperature, the other well can be ramping up to the next set point. The 9011 is a high performance dry-well with stabilities to ±0.01°C and display accuracy to ±0.1°C. With RS-232 interface with free instrument control software as a standard feature, temperature calibration work can be automated for efficiency. Users can choose from four standard multi-hole inserts (6-8 holes per insert) to select the appropriate fit for temperature probes. Up to eight 1/4" (6.35mm) probes can be calibrated simultaneously. The price of the 9011 is $8,695 and includes full calibration report with test data. Units are shipping with delivery at 3-4 weeks A.R.O.